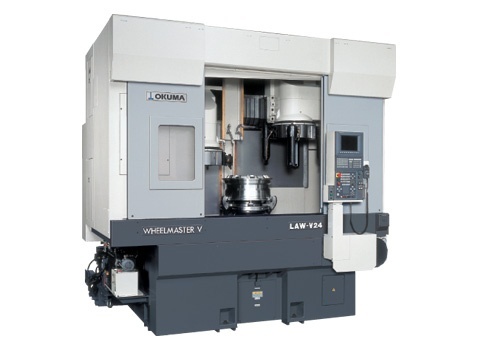 The LAW-V24 CNC turning center, the latest evolution of Okuma's large 4-axis turning center for aluminum wheel machining, has two turrets that offer improvements in flexibility and cycle time. The machine has Okuma THINC-OSP® control, two independent 6-station turrets, 3,000 rpm and 87 HP with a large frame and machine travels that can produce a 24 inch wheel. The vertical orientation achieves superior chucking of large wheels and exceptional chip removal.